2016 was quite a year! As the year progressed, a new President-elect, the loss of several pop culture icons, and the Olympics were top of mind for many. As the year comes to a close, here at Laserfiche we’re looking back at some of our most memorable moments. “In the new version of the web client we’ve added a bunch of cool features. The toolbars are fully customizable, which users have been asking for. We’ve added several reporting features to help administrators confirm that they have their security configured the way they want, and these reports can also be used to demonstrate this to auditors. Brian McKeever working on the latest advances in Laserfiche software. 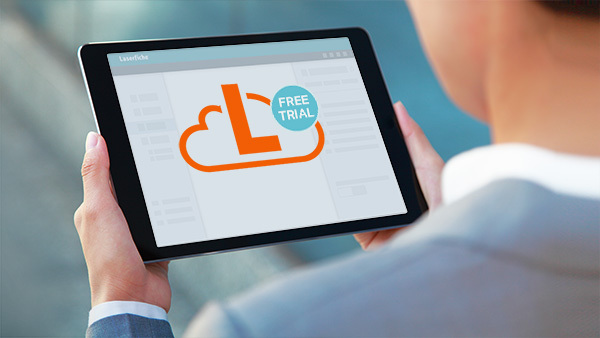 “It was a big year considering we launched the Business Process Library (BPL) in April as part of the 10.1 release! We now have over 75 processes across 11 different departments, categories and industries—and the processes available for download will only continue to grow from here. Developing the BPL has definitely been a major team effort, drawing expertise from all across Laserfiche and, of course, input from our customers. “Under the guidance of our new managing director Sean Tang, 2016 has been a successful year filled with many great achievements for Laserfiche International Ltd. (LFI), which supports Laserfiche partners and clients in Latin America, Canada, Europe, Africa, the Middle East, and the Asia Pacific. In January, we kicked off the year with the Empower Conference, where we held our ever-popular reception welcoming attendees from 30 different countries. We also recognized Run Smarter® Award winners including Intertrust Group, CSCBank, Orascom Construction, Emirates National Oil Company, Avis Fleet and The Organization of Islamic Cooperation (OIC) for their innovation and creativity in using Laserfiche software to achieve exceptional business results. In April, we welcomed attendees from around the world to the sixth Empower Middle East Conference in Beirut, Lebanon, which highlighted the release of Laserfiche 10 and included keynotes from Laserfiche CEO Chris Wacker and BMB Group CEO Mitri Doumet, among others. The continuing popularity of this event really showcases the strength of our users and reseller partners in the Middle East region! 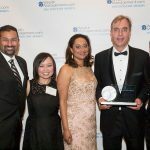 In June, we sustained a three-year streak by winning the Enterprise Content Management Software award from Computerworld Hong Kong. This award is particularly meaningful because winners are chosen by Computerworld Hong Kong readers. 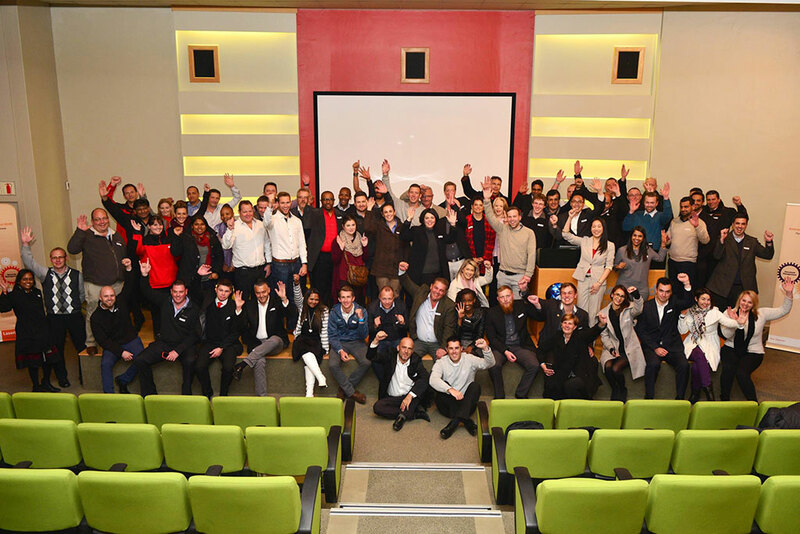 And perhaps most exciting, in 2016 we hosted our first user group meetings in South Africa and the United Kingdom – attracting more than 120 attendees to each meeting – to share new methods in using Laserfiche business process automation tools to become more efficient than ever. International #FicheFriends at the 2016 User Group in South Africa. “It’s been a busy year for the HR team at Laserfiche! In addition to offering additional benefits and incentives to our Laserfiche family, the HR team focused on bringing more employee engagement events and activities to Laserfiche. In 2016 alone, we brought tasty treats from the In-N-Out truck, Yogurtland and Kona Ice in addition to hosting our annual Halloween party, Gingerbread House contest and holiday party. 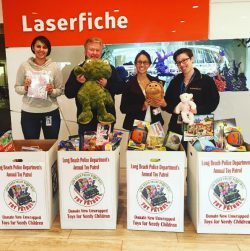 Laserfiche participated in the annual Long Beach Police Department Holiday Toy Patrol. “The highlight of my year was the ‘East Coast Tour’ that I went on with Marketing Director Melissa Henley. We were able to visit our friends in Loudoun County, VA, attend the annual Statewide Virginia User Group, and spend a few days with Tompkins County, NY, and some of its shared services partners. 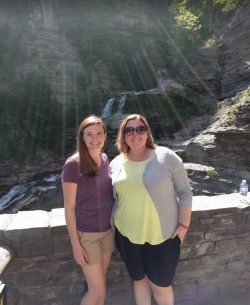 Katie Burke and Melissa Henley in front of Cayuga Lake in Ithaca, NY on their trip to visit #FicheFriends in the North East! 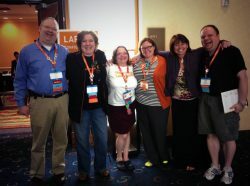 “It’s no secret that I love our Laserfiche community – or if you follow me on social media, my #FicheFriends. Working with our users constantly inspires and invigorates me, so meeting everyone at the Empower Conference is the highlight of my year. I love seeing friends new and old, hearing about the solutions you’ve developed and the successes you’ve realized, and discussing the new ideas you can’t wait to put into action. The so-called “League of Laserfiche”: Melissa Henley and #FicheFriends gather at Empower 2016. 2017 is sure to be another fantastic year at Laserfiche. We’re looking forward to making plenty of wonderful memories at #LFEmpower in February, so be sure to register as soon as possible for the conference, and connect with #Fichefriends beforehand on the Empower App (download it here for iOS and Android devices). We’ll see you in the New Year!